Noon today, the Executive Team held a conference call with the Office Directors and the Regional Administrators. Bill, Neil Sheehan and I participated in the call. (Bill/Neil, please add anything I missed or correct/clarify as needed). There will be a TA call at 3:30 pm. > NRC external communications will be via the HQs Liaison Team and OPA. Filter requests through the HOO. > NRC remains in the monitoring mode. Chairman attended a meeting with White House. Marty Virgilio participated by VTC. > Assistance offer to Japanese regulators, but do not currently need NRC support. > US team deployed consisting of 60-70 people to assess the disaster (not limited to nuclear). NRC has supplied one team member who will be a technical consultant. A second staffed is trying to get on a flight to Japan to support the team and the US embassy. > Parts of the industry mustering to offer industry support. 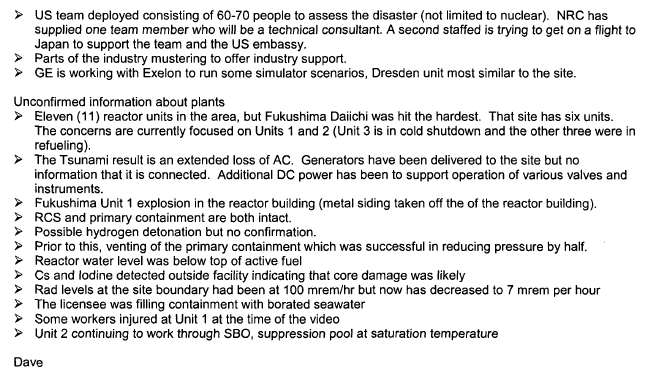 > GE is working with Exelon to run some simulator scenarios, Dresden unit most similar to the site. 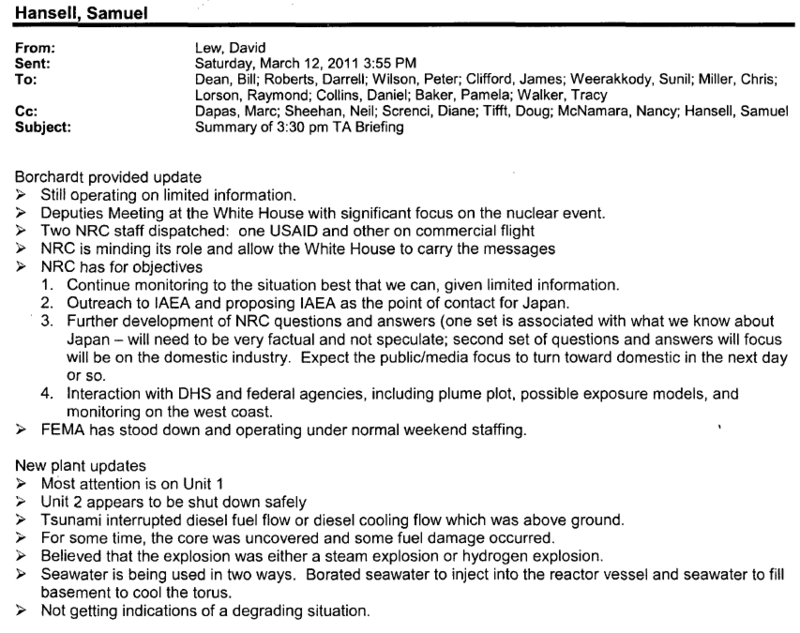 > Eleven (11) reactor units in the area, but Fukushima Daiichi was hit the hardest. That site has six units. The concerns are currently focused on Units 1 and 2 (Unit 3 is in cold shutdown and the other three were in refueling). > The Tsunami result is an extended loss of AC. Generators have been delivered to the site but no information that it is connected. Additional DC power has been to support operation of various valves and instruments. > Fukushima Unit 1 explosion in the reactor building (metal siding taken off the of the reactor building). >’ RCS and primary containment are both intact. > Possible hydrogen detonation but no confirmation. >’ Prior to this, venting of the primary containment which was successful in reducing pressure by half. – Still operating on limited information. > Deputies Meeting at the White House with significant focus on the nuclear event. 1. Continue monitoring to the situation best that we can, given limited information. 2. Outreach to IAEA and proposing IAEA as the point of contact for Japan. 3. Further development of NRC questions and answers (one set is associated with what we know about Japan – will need to be very factual and not speculate; second set of questions and answers will focus will be on the domestic industry. Expect the public/media focus to turn toward domestic in the next day or so. 4. Interaction with DHS and federal agencies, including plume plot, possible exposure models, and monitoring on the west coast. > FEMA has stood down and operating under normal weekend staffing. > Tsunami interrupted diesel fuel flow or diesel cooling flow which was above ground. • For some time, the core was uncovered and some fuel damage occurred. Believed that the explosion was either a steam explosion or hydrogen explosion. Seawater is being used in two ways. Borated seawater to inject into the reactor vessel and seawater to fill basement to cool the torus. > Not getting indications of a degrading situation.